Note: This review is for the Layla mattress, available exclusively online. The Layla company boasts memory foam infused with copper as a big benefit. Read on for our evaluation of this mattress according to our battery of tests, and for our assessment of the copper foam. We also cover recent changes to the cover and to the top memory foam in our 2019 updated Layla review video. If you’d prefer to watch rather than read, check out our full Layla mattress video review above. GoodBed's Take – Who is the Best Match for a Layla Mattress? The Layla mattress is a memory foam and foam bed with a couple of interesting properties. Most noteworthy (and about which the company talks a lot about) is the bed's memory foam, which is infused with copper. Copper is a proven conductor of heat, so the concept of including it in the foam means it may have a benefit in drawing heat away from the body, a bonus if you "sleep hot" or even for women experiencing hot flashes. Copper's conductivity is a proven fact, but other claims about copper are more anecdotal. On the Layla website, copper is said to have anti-microbial benefits that could keep you from getting sick. And the company also notes that some using its mattress experience better energy and improved circulation, which the company admits are hard to prove. We took a close look at the actual foam in the Layla mattress. Aside from a subtle copper color of the foam, you really can't see or feel any kind of hard metal particles, so there's no worry that there are actual metal bits in the mattress. We gather the company uses copper dust or very minute particles of it. The company has a whole page on its copper technology. Another interesting feature is the Layla mattress's cover, which includes infused gel. This is supposed to make the cover cool to the touch, and indeed, in our tests, we really did note a difference. The mattress cover was notably cooler than other items in our test room. Again, this could be a benefit for those concerned about getting hot while sleeping. The cover can be removed but it is dry-clean only. Lastly, the Layla mattress can be flipped -- something that's rare these days. One side of the mattress is softer, while the other side is quite a bit more to the firm side. That could be a benefit if you're not sure which you'll prefer, or if you needs and preferences change over time. We mainly evaluated the Layla bed on the soft side, but we add comments about the firm side as well. Note that with the original Layla bed, the cover had to be removed and replaced when flipping the mattress, but the latest version no longer requires this. Overall, we found a lot to like about the Layla mattress. We found it to be a good fit in terms of back support and spinal alignment for our tester, and felt it would suit a wide variety of individuals in most sleeping positions. In circumstances where we questioned the suitability for a type of sleeper, we thought simply flipping the mattress to the other side would solve concerns. Of note, the Layla mattress is available only online. While several of its competitors have begun opening showrooms, or entering partnerships with existing brick-and-mortar stores, you won't be able to try the Layla before you buy it. The company does offer a 120-night trial period with a full refund, so that should give peace of mind to those uneasy with buying a mattress sight unseen. The price of the Layla mattress is very competitive, right in line with its online peers. You can place the Layla mattress atop the support of your choice, including a separately purchased box support, a bed frame, platform bed, or adjustable bed frame. The company sells an inexpensive matching wooden box frame, but it's not a required purchase. The Layla mattress is a 11″ thick mattress comprised of 4 layers (listed below from top to bottom). Note that the company calls this a 10" mattress. We measured 11 inches. It's important to note that the Layla mattress can be flipped.The top layer (3 inches of memory foam) and the bottom layer (1 inch of memory foam) are made of the same copper-infused memory foam in a 3.5-lb. density. This accounts for the softness difference on each side of the mattress. Under the 3-inch layer of memory foam is a 2-inch layer of convoluted (egg crate) polyurethane foam, meant as a transition layer in between the softer memory foam and the 5-inch block of support foam below. The four layers of the Layla mattress are wrapped in a fairly tightly woven cover that's removable via a zipper. The cover is well marked with "soft" and "firm" so you'll know which side is which. The soft side gets the lighter cover, while the firm side gets the darker fabric. As a cooling feature, the cover is infused with gel, and we did feel that it felt notably cool to the touch. The Layla mattress comes with two sides; the company calls them simply "Soft" and "Firm." The soft side is most popular, and by default the mattress comes set up with the soft side on top. On our scale, we judged the soft side to be a bit softer than what we would call medium. The firm side is quite firm, and we'd call it a true firm. As you might expect, we found the soft side of the Layla mattress to have deeper than average cushioning depth, and this side may be a good fit if you enjoy more of a hugged or cradled feeling from your mattress. On the firm side, the story was the opposite, with more of a floating-on-top of the mattress feeling. The copper-infused memory foam is quite slow responding, and it takes some time for it to come back to shape after being compressed. It's worth noting that our look at the original Layla bed in 2017 found the foam to be quick responding. Layla has since substituted a slower responding foam for the top and bottom layers. Overall, we thought the Layla mattress had a good solution for all sleeping positions, depending on whether we were on the soft or firm side. If you have a partner with different preferences and needs than yours, that could be an issue. 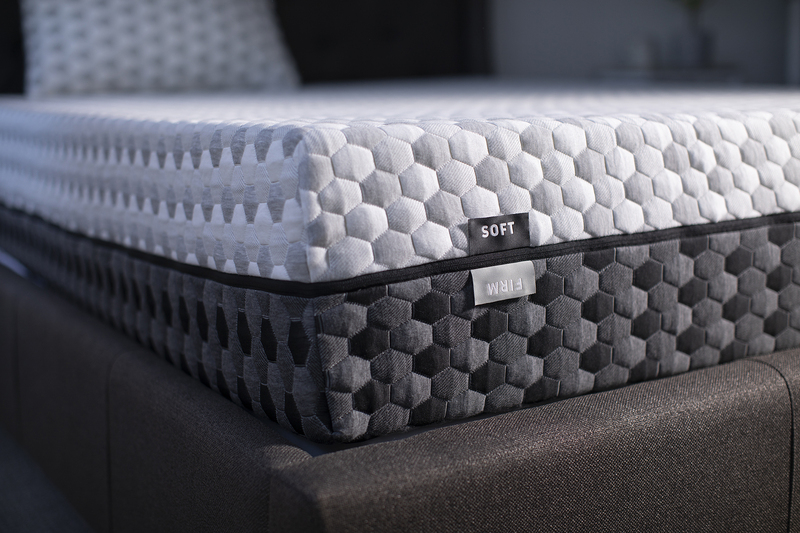 Generally, we felt that the softer side was an excellent choice for most back and side sleepers, while stomach sleepers would experience better support and spinal alignment from the firmer side of the Layla bed. 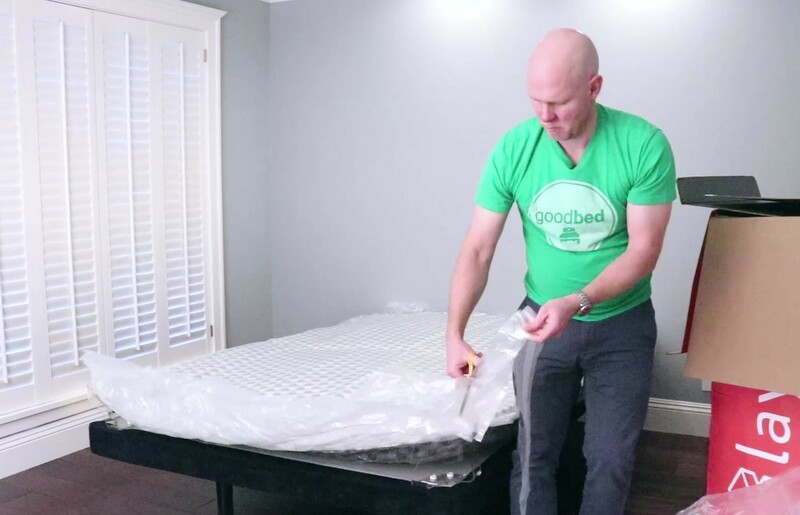 Our 200-pound tester felt this mattress to be excellent while on his back, and he felt a wide variety of people would experience similar support. Hips sunk in just enough, and his lumbar area felt well supported. Heavier individuals might find hips sinking too deeply into the mattress, and might be better supported on the firm side of the Layla bed. Spinal alignment for our tester was also very good when on his side, and again we felt most people would have a similar supportive experience in this position. And once more, heavier individuals may find the firm side to bet a better fit, as hips and shoulders could sink too deeply into the soft side of the mattress. 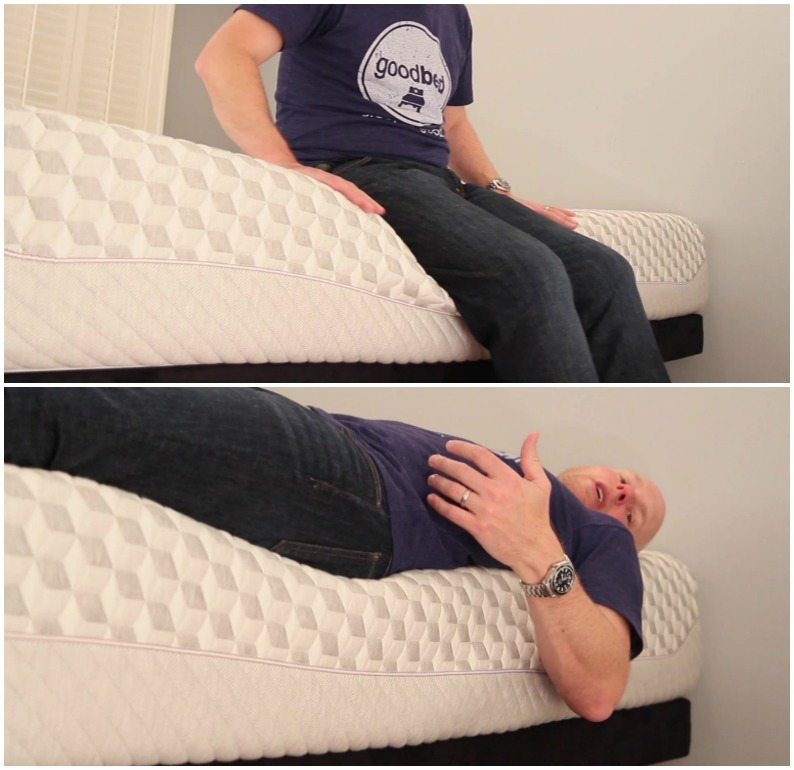 Achieving good spinal alignment for stomach sleepers can often be trickier as the hips can tend to sink down too far with some mattresses, and that was the case for our tester when trying the soft side of the Layla mattress. When he switched to the firm side, he felt very supported, however. For those who predominately sleep on their stomachs, the firmer side is likely a better fit, with the exception of those who are very light. Overall, we found the pressure relief offered by the Layla bed to be excellent on the soft side. Our tester experience no hot spots. When he tried the firm side, however, he quickly noticed pressure in his shoulders and hips. Those that are quite a bit heavier than our 200-lb. 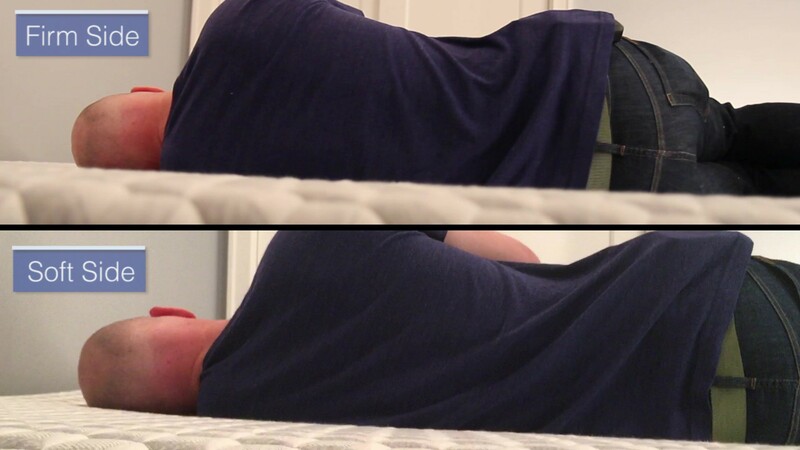 tester might "bottom out," sinking through the mattress's 5 inches of comfort material. 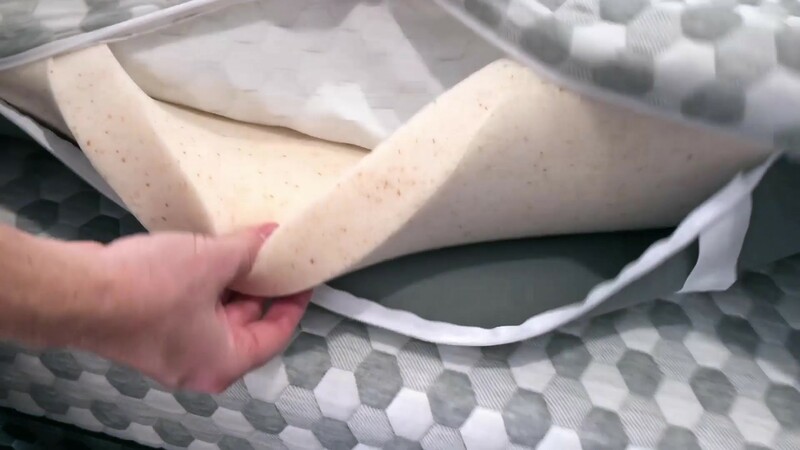 In our video update of the latest Layla mattress, published in April 2019, we took a look at the new Layla Mattress Topper, an optional accessory that can be used with the Layla mattress, or with any mattress. It's made of a 2" layer of the same copper-infused memory foam used in the Layla mattress, and is wrapped in the same cover fabric. We tried the mattress topper on both the soft and firm sides of the Layla bed. On the Firm side, we felt the topper basically made the mattress feel like the soft side, so there's little advantage. When used on the soft side, however, the topper gives the mattress quite a lot of extra softness and cushioning. While the soft side of the mattress, on its own, we classify as a Medium Soft, adding the topper made it more of a straight-up Soft. The topper also added deeper cushioning, with more of a hugged/cradled aspect. Current pricing for the mattress topper is $299 for the queen size. Get more info on the Layla website. 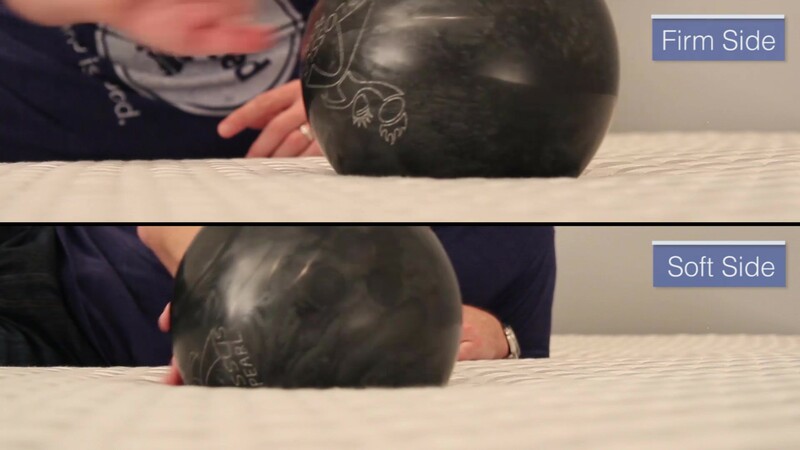 With a bowling pin standing upright on the Layla bed, we tested motion isolation by dropping a 16-lb. bowling ball on it, as well as the whole weight of our 200-lb. tester. With the bowling ball, the pin wiggled a bit; because the cover on the Layla bed is quite a tight fit, we noticed it pulling just a bit, enough to affect the standing pin. In practical use, this might mean you could feel a partner repositioning a bit, but we did not think it would be an issue for most people. When our tester dropped his full weight on the bed, however, the pin did not move at all, so we did not think that most people would be bothered by a partner (or kids/pets) getting in and out of bed. For most people, we think the Layla mattress will not feel hot, especially because of the copper infused into the memory foam, and the cooling cover. If sleeping hot is a known issue for you, foam beds in general are likely not the best choice. Rather, something like an innerspring or pocketed coil bed might offer better natural air flow. But overall, we did not think most people would have any trouble on the Layla bed. Foam mattresses aren’t typically very supportive along the very edge of the mattress—important if you like to sit on the edge of the bed, or if you tend to sleep along the edge. But the Layla mattress performed very well in this respect. Our tester felt stable both sitting and laying on the edge of the bed. On both the soft and firm sides of the Layla mattress, our tester did not find movement/changing sleeping positions terribly difficult. It was certainly easier on the firm side. On the soft side, it was a little more difficult owing to the slow-responding memory foam. For those with acute mobility issues, the Layla bed (or any memory foam mattress) might not be the best choice, but for most people, we do not think movement will be difficult. In the case of the Layla mattress, the company makes no claims about the use of natural materials, however all of the foams used are certified to the CertiPUR-US standard, which verifies that a material has low VOC off-gassing as well as a lack of chemicals and other substances regulated by the CPSC. The company does assert that returned mattresses will be recycled or donated to charity. In fact, should you choose to return your Layla bed, the company will send a charity to your home to pick it up. If you plan to use your mattress atop an adjustable base, the Layla mattress is a very good choice. We tested the Layla bed with a standard adjustable base and found that right away, the mattress conformed nicely. Prices shown are list prices. Remember that GoodBed keeps our site current with the best available discounts on all online mattresses, many of which are exclusive discounts for our readers. Note that Layla officially calls this a 10-inch mattress, while our measurement was 11 inches. The Layla bed is an 11-inch mattress with a unique copper-infused memory foam on both the top and bottom of the mattress, intended to promote heat dissipation. One side is "Soft" and the other is "Firm" meaning the mattress can be flipped to best suit your needs and preferences. The cover of the Layla bed also has cooling properties, and we found that this did seem effective. With a price that's right in line with competing mattresses, these features to help Layla stand apart. When it comes to estimating the comfort lifespan of a mattress, we tend to use foam density as our best, albeit imperfect, predictor of how long a foam will retain its shape and resiliency. In the case of the Layla mattress, the memory foam has a density of 3.5-lbs. When we first reviewed the mattress, density was 3 lbs., so this is a recent improvement that should boost expected longevity. The remaining foams are of a standard 1.8-lb. and 2-lb. density. Overall, we expect the Layla bed to hold up about as well as competing mattresses. On balance, we feel that Layla mattress is a unique product that’s exceptionally supportive for the majority of individuals. The dual-sided mattress also offers options for those who might not be sure what type of bed they prefer, or for those whose needs and preferences change over time. Layla includes free delivery, which is not particularly unusual among its competitors. Note that orders shipped to Canada, Alaska or Hawaii do incur a delivery charge. One of the biggest, if not THE biggest complaints about any mattress from consumers regards body impressions — the inability of a mattress to spring back, eventually creating a low spot/sinkhole in the mattress. As such, mattress warranties all contain a term defining how big a sag or ‘body impression’ (measured when no one is on the mattress) is considered a defect, and thus covered under the warranty. The industry standard for mattresses is generally between ¾” and 1.5”. Layla has chosen to cover indentations that meet or exceed 1”. Practically speaking, that means any softening or sagging would need to be at least that deep before the warranty would offer you protection. See: Layla warranty policy. Summary: Is the Layla Mattress Right for You? Is the Layla mattress right for you? Take our Mattress Match Quiz to find mattresses that fit your needs, based on your preferences and price range. Looking for more on the Luxi mattress? Click here to visit their website at Layla.com.